Rice baseball pitcher Evan Kravetz thought he’d be pitching out of the bullpen this year. Instead, he’s become a staple in the starting rotation. The 2019 Rice baseball season was met by many with guarded optimism. The Owls had hired energetic coach Matt Bragga from Tennessee Tech and had seemed to have enough pitching to be competitive from game to game. The supposed pitching strength relied on the arms of Matt Canterino and Addison Moss, arguably the best one-two punch in Conference USA. That duo never materialized as expected. Moss was scratched from opening weekend with injury concerns, opening up the door for someone else to make a start in the rotation. That someone would end up becoming senior southpaw Evan Kravetz. “I found out like two days before the opener,” Kravetz recounted, following his career-best 13 strikeout performance against Middle Tennessee over the weekend. His seven-inning, one-hit gem helped secure a series win and would eventually lead to the first home sweep of the Matt Bragga era at Rice. Win or lose, good or bad, Kravetz maintains he’s thankful for the opportunity. “Every Saturday I pitch like I don’t know if there’s going to be another Saturday to pitch on, so I’m just going to keep doing that and trying to win games,” he said. It doesn’t look like Kravetz is in any danger of missing out on a start any time soon. He leads all Rice pitchers with 77 strikeouts, one more than staff ace Matt Canterino who entered the season as a consensus Top 5 round prospect in the upcoming MLB Draft. Kravetz had made four starts at Rice prior to this season. He’ll come close to matching his previous total career innings pitched at Rice (90.1) this season if Rice makes it to the conference tournament. All Kravetz wanted was an opportunity. He got his chance and made the most of it. It was November 7, 2014 and the Ladue Horton Watkins Rams trailed Webster Groves 28-6 at halftime in the Missouri state playoffs. Jack Fox, the quarterback for the Rams, was nearing the completion of his high school career — it wouldn’t end that night. That’s because Fox was asked to do something out of his comfort zone in a high leverage situation. He rose to the occasion. As the Rams mounted their second half comeback, Ladue Horton Watkins head coach Mike Tarpey saw an opportunity. With the Rams’ opponents crashing on one side of the line, Tarpey dusted off the quarterback option and called it toward the opposite boundary. The play was scarcely used. It wasn’t remotely integral to their offense. Still, with the fate of the season on the line, Fox took the snap, took off, and didn’t stop running until he was standing in the endzone. Ladue Horton Watkins would win the game and go on to finish 12-2 that season after a deep playoff run. Fox was the hero. Not just because he had the big play, but because he was always the guy who made the big play. For Fox, dependability has always been a reality. Coach Tarpey, who saw Fox up close in person for four years, knows that better than most. From day one, Tarpey knew Fox was different. “Other coaches would comment about your kicker,” he said. In his 19 years of coaching that’s not something he’d heard very often. The small school was filled with two-way players. Everyone wore multiple hats, but none seemed to warrant as much attention as the guy doing the kickoffs. Tarpey called Fox “an athlete that can also punt and kick”, adding that Fox was the kind of person who could completely compartmentalize the game, wiping negative plays from his short term memory in order to focus on the task at hand. Tarpey used words like “deliberate”, “methodical” and “perfectionist” when it came to how Jack Fox attacked the game. That focus and level of detail gave way to a college scholarship. In the fall of 2015, Fox traded one blue uniform for another and transitioned permanently to a special teamer at Rice. He handled kickoffs during his freshman season, but quickly expanded his role to extra points and his first collegiate field goal against North Texas. The following season Fox became the Owls’ punter, taking over for James Farrimond who had begun his own senior year on the Ray Guy Award watch list. Fox had big shoes to fill, but no matter the stage, things never seemed too big for the eager specialist. Fox averaged 40.7 yards per punt with a long of 58 yards that season, improving his average to 44.2 yards in 2017 with a career-best 62-yard boot. That wasn’t enough for Fox, who applied the same taciturn commitment to his craft every week. Not a “rah rah” vocal leader, per se, Fox led by humble example, grinding away to be the best version of himself he could be. He hadn’t yet begun to realize what might come if he continued to improve his game. He was just determined to get better. Things took off when special teams coordinator Pete Lembo was hired from Maryland the spring prior to Fox’s senior year. A previous head coach at several stops in the northeast, Lembo had coached several specialists who’d taken their shots at the NFL. 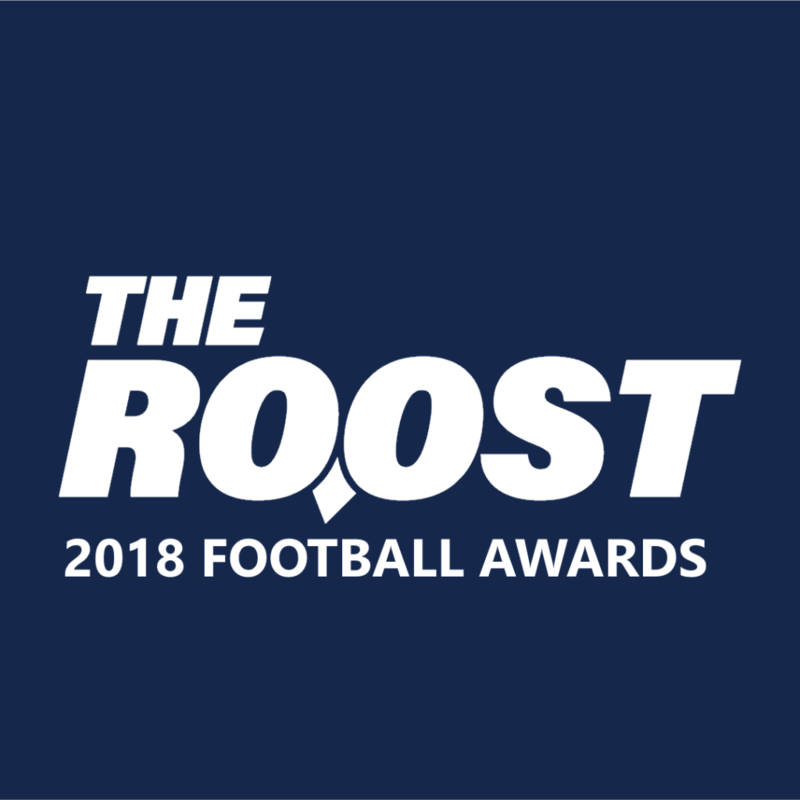 By his own admission, none of them, save perhaps Ray Guy award finalist Scott Kovanda at Ball State, measured up to the pure talent Fox possessed. Lembo’s insertion into the special teams’ room gave Fox structure. That order helped Fox clear his head and focus on the intricacies of punting and kicking. The Rice specialists watched film of themselves, other collegiate specialists and NFL greats. Lembo helped Fox break down what elite punting ought to look like and Fox translated those lessons to the field. The impact of Lembo’s guidance was readily apparent in Fox’s breakout 2018 season. The year began with a walk-off win over Prairie View A&M, spearheaded by five field-flipping punts by Fox and his first-ever game-winning field goal as time expired. It only got better from there. Fox would lead Conference USA with an average of 45.5 yards per punt, 31 punts inside the 20-yard line, 26 punts of 50 or more yards with a long of 76 yards against North Texas. In a few short months, Fox had gone from scarcely entertaining professional football to being in rooms with NFL coaches and personnel on a regular basis. It’s been a whirlwind, one that Fox acknowledges he didn’t see coming. Live it, Fox has. As a testament to his incredible senior season, Fox was awarded Rice Football’s George R. Martin Award, given annually to the team’s most valuable player. Not only the Rice football MVP, Fox was named the Conference USA Special Team’s Player of the Year, the first punter to ever win the award. To top it all off, Fox finished as a semi-finalist for the Ray Guy Award, given to the nation’s best punter. Not one to sit back and bask in his own success, Fox kept working. He represented the Owls at the East-West Shrine Game, where he blasted a 57-yard punt in front of NFL coaches and scouts. From there he traveled to Indianapolis for the NFL Combine, came back to Houston for Rice Football’s 2019 Pro Day, and spent the last few weeks of April doing individual work outs for several NFL teams. Throughout his years of development as both a football player and a person, perhaps no word better describes Fox than that: consistent. Whether it was stepping up to the plate in the key moments of a high school football game, the game-winning field goal over Prairie View A&M or the countless field-flipping bombs he launched to keep his 2-10 team in games, Fox has never waived. That’s Jack. He’s the best who refuses to cease his own efforts to become even better. He’s been so busy perfecting his craft, his big moment, coming in the next few days, has almost snuck up on him. His apparent easygoing disposition is genuine. The way he describes it, “kicking and punting is definitely a big personality thing.” Whether it’s a certain level of quirkiness or an abnormal attention to detail and a process-oriented perspective, Fox is the total package. And even if he wasn’t, he’d work at it until he was. Because that’s who Jack Fox is. The former All-Conference high school quarterback became one of college football’s best punters, and he did it in four years. If the past eight years have been any indication of what the future holds, Fox is going to build on this foundation and continue to improve. He might get drafted, he might not, but Jack Fox is going to do everything within his power to kick in the NFL, a notion which is still a bit surreal for the small-school kid from Missouri. Making a roster as an NFL specialist isn’t easy, neither is being drafted. Conversations with NFL teams have given Fox a feel for his future. Ultimately, though, he still doesn’t know what the NFL Draft holds for him. All he can do right now is enjoy the process. “This whole thing is really cool,” Fox revealed with a twinge of angst in his voice, “It’s been really exciting, but I’m ready to know where I’m going to go and kinda start focusing on the next chapter of the whole thing.” That next chapter remains a mystery. From the Combine to his workouts, Fox has spoken with nearly every NFL team. He’s established better relationships with some, but has yet to receive any guarantees. Few punters have more ability than Jack Fox, but he’s made it his mission to ensure no one outworks him. So far the results speak for themselves. Rice baseball picked up their first home series sweep under head coach Matt Bragga, winning three games against Middle Tennessee State to improve to .500 in conference play. Rice entered Easter weekend with a bad taste in their mouth. The Owls had blasted Charlotte in their series opener and outscored them by 10 runs over the course of three games only to drop the series. With no midweek game to take their mind off the tough blow, all efforts turned to Middle Tennessee. Coach Bragga’s charge to his team this weekend was straightforward. “We need to start making a move if we’re going to make one.” Rice made their move, sweeping their second conference opponent this season. Here are some notes on an encouraging series at Reckling Park. Rice RBI leader Andrew Dunlap got things going in the series opener with an RBI single in the first inning. The Owls took the 1-0 lead into the third where they broke the game open, batting around and scoring eight runs on six hits and four walks. Justin Collins and Braden Comeaux picked up two RBI apiece, with four other Owls driving in one run during the big inning. The nine-run cushion was more than enough for Matt Canterino, who put together what was arguably his best outing of the season. He struck out 10 in seven innings, earning his team-leading fifth win of the season. Middle Tennessee would tack on four against Rice reliever Drake Greenwood, but the sizable lead would hold for the Owls’ fourth-straight win in series openers. The Owls’ bats got off to a slightly slower start on Friday night, but once they woke up, they caught fire. Two home runs, one by Cade Edwards another Dominic Cox, put Rice ahead 2-0 in the fourth inning. Then the Owls exploded for five runs in the fifth. Bradley Gneiting, Trei Cruz, and Andrew Dunlap strung together three consecutive RBI hits. Dunlap came around to score the seventh run on an error. The 7-0 lead would hold until the ninth inning where once more MTSU would collect a flurry of hits, scoring two, not enough to give the Owls much of a scare. For the first time in the weekend, Rice was forced to come from behind. Starting pitcher Jackson Parthasarathy wasn’t as sharp as his predecessors on the mound. He would have been serviceable had the defense not committed three errors on the day, two of which resulted in three unearned runs charged to Parthasarathy. Trailing 4-0 after Parthasarathy was removed midway through the third inning, Rice began to chip away. Rice got two in the third, one in the fourth and one in the fifth before tying the game in the seventh on a Cade Edwards sac fly. Justin Collins would drive a two-out single to left later in the inning, scoring what would be the game-winning run. MTSU didn’t make it easy, loading the bases in the ninth. With the tying run in scoring position, Kendall Jeffries induced a double-play to clinch the victory and the series sweep. It’s been no secret the Rice starting pitching is the strength of this team. When all three of the Owls’ rotation are locked in this team is going to have a chance to win most series. Aside from the sloppy defense on Saturday, the starting pitching was nearly as good as it’s been all season this weekend against Middle Tennessee, and the results were the first home series sweep of the Matt Bragga era. Canterino, Kravetz and Parthasarathy combined for 27 strikeouts with five walks, and one earned runs allowed. That’s a stellar line through 16.2 innings on the bump. More length out of their Sunday starter would have been ideal, but an extremely fresh bullpen gave coach Bragga a bit more leeway with how long he left Parthasarathy on the mound. If Rice pitches this well, they’ll have a chance to win each of their remaining CUSA series. The Rice lineup has become more consistent as the season has gone on. Slowly but surely the top three became the top four. Somewhat quietly, Cade Edwards has entrenched himself as part of the glue which holds this offense together. Batting fifth throughout the weekend, Edwards picked up six hits, batting .600 in the series with the go-ahead home run on Friday and the game-tying sac fly on Saturday. Rice has officially passed the midway point of conference play. It’s been a bumpy ride, but after starting 0-5, Rice has won nine of their next 14, pulling themselves back to .500 in conference play. It’s no guarantee of future success, but it is a testament to a team willing to fight. With four series remaining, Rice is in the thick of the pack in Conference USA. FAU leads the way at 14-4 with the Owls five games behind, tied for fifth. They entered the weekend tied for seventh, with tiebreakers putting them in ninth place. Winning the conference is still mathematically possible, but even without an incredible late surge, Rice has enough season left to position themselves for the conference tournament in Biloxi. Entering the weekend D1 Baseball projected Conference USA to be a two-bid league with league-leading FAU sitting in the First Five Out. Rice has a few signature wins (TCU, Baylor), but the chances of reaching the postseason with a sub-.500 overall record will be slim to none. One of the biggest surprises of the spring was the dominant performance of the Rice football offensive line. Their development is just getting started. The youth movement is in full force on South Main and few position groups are immune. The defensive line looked to be one of the deepest groups on the team following the 2018 season. Then the transfers of Roe Wilkins and Zach Abercrumbia put a near-certainty into a state of flux. Between Abercrumbia, Wilkins and rush end Graysen Schantz, Rice will have to replace 151 tackles and 13 tackles for a loss. Void of their old leaders, new guys have been forced to step up and lead the way. The results after spring ball were extremely encouraging. “It’s a new group with a new identity,” said defensive line coach Cedric Calhoun. “They want to be good. They want to understand the concepts and want to play at a [higher] level.” That next level was evident from the very beginning. Trey Schuman and Elijah Garcia have stepped up their efforts, so too did guys like Myles Adams and Kenneth Orji. Their success came at the expense of the offensive line. That unit, buoyed by the addition of grad transfer Nick Leverett, was expected to take a large step forward in 2019. That still might be the case, but the intensity and disruptiveness of the new-look defensive line made any sort of sustained rhythm out of reach this spring. To some extent, the process isn’t rocket science. “We teach smart, tough and being reliable… Fundamentals are day in and day out,” Calhoun said. His group has approached the task at hand with the level of focus necessary to find success. They’ll need to find a way to transfer that knowledge to the field on Saturday’s in the fall. Spring ball is over, but recruiting season never ends. 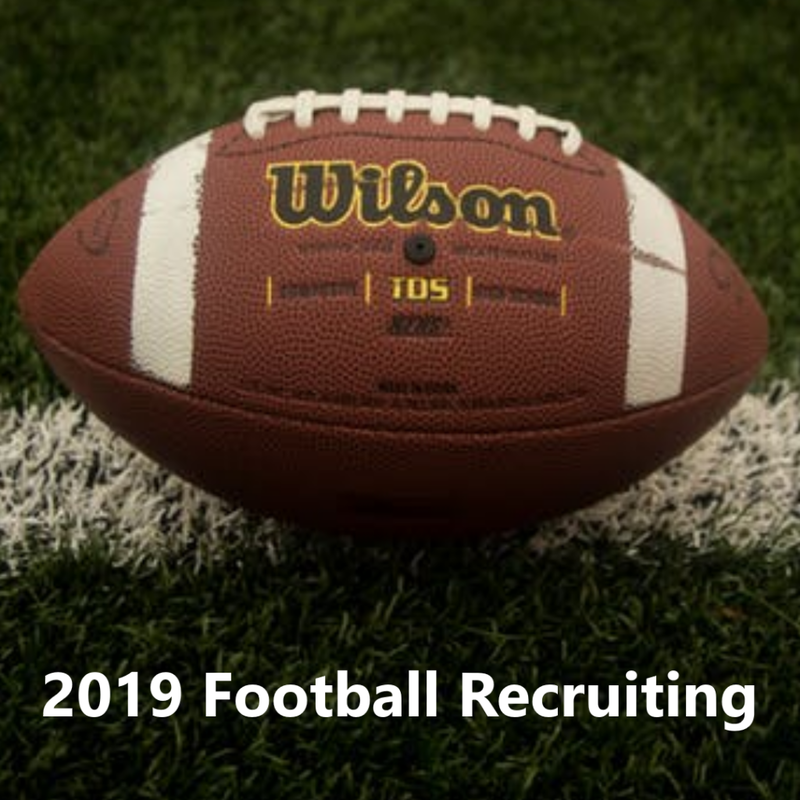 The 2019, 2020 and 2021 Rice football recruiting class are moving quickly through the spring. The Rice football spring game was the last big on-campus push the Owls will have for a few months. With spring workouts complete, the coaching staff will hit the road and start another run of visits before the camp circuit begins in earnest in the summer. 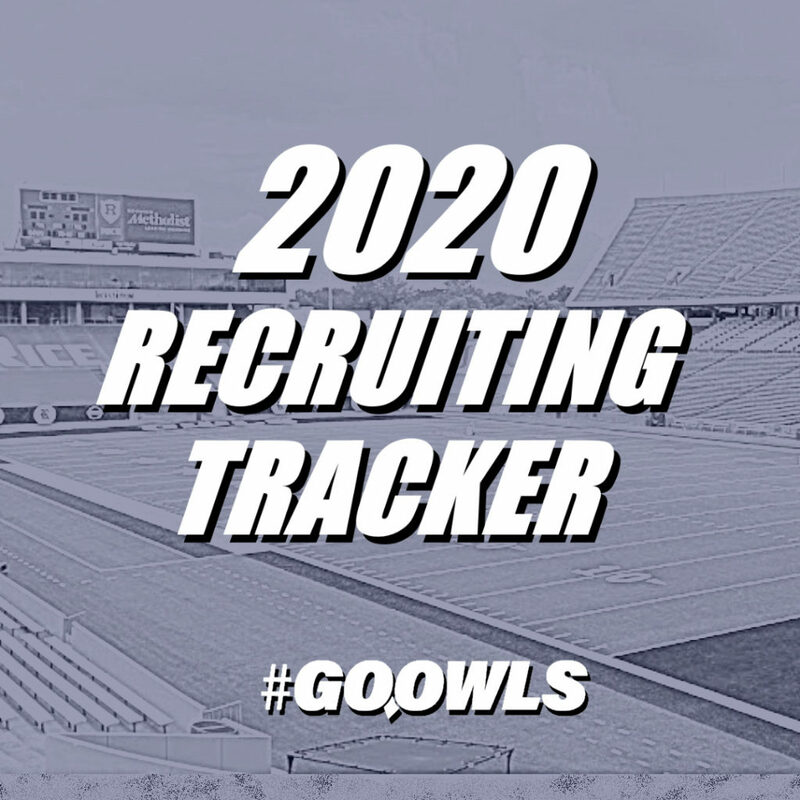 Entering another busy recruiting season, here’s where the Owls stand on several recruiting fronts. Rather than reach for additional high school prospects the staff didn’t love, Rice left a handful of spots in the 2019 class open following National Signing Day. One of those spots will go to Reagan Williams, a fullback transferring to Rice from Stanford. Rice came extremely close to picking up a commitment from Texas transfer Kyle Porter, losing out to Houston at the last minute. They’ve made more lasting traction with a few other transfer targets, a few of which could make their decisions in the next few weeks. Ideally, Rice wants to have all of their 2019 spots full before summer practices get underway in June. Keep an eye out for two more additions to finish off the class. After a fast start on that front. Rice has hit a few snags in early April. Wide receiver Logan Kyle opted for Vanderbilt over Rice while both offensive lineman Drake Metcalf and tight end Drake Dabney have picked up offers from Power 5 programs. Several other top targets could follow. An offer from a Power 5 program isn’t a hard stop for Rice, at least, not anymore. Current commit Braedon Nutter has a Colorado offer, but that didn’t deter him from staying home. The value proposition of Rice is gaining traction. Playing D1 football and earning a nationally recognized degree has value. Rice won’t win all of these battles, but don’t be surprised if they start winning more of them in the near future. The first batch of offers for the 2020 class went out this February. It’s probably safe to say the first 2021 offer comes out significantly quicker. Rice has been quicker on the game this year with the younger classes. 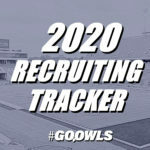 Although they haven’t extended any formal offers yet, several 2021 prospects were on campus for the Owls’ spring game. Several current sophomores had the chance to take in the game and meet with the staff including corner Miles Jones, wide receiver Cameron Moore and quarterback Wyatt Begeal. The impact of the Owls’ new Director of Recruiting Alex Brown is being felt in a very tangible way.